This book is the first systematic account of the syntax and semantics of names. 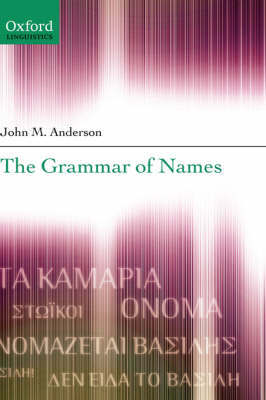 Drawing on work in onomastics, philosophy, and linguistics John Anderson examines the distribution and subcategorization of names within a framework of syntactic categories, and considers how the morphosyntactic behaviour of names connects to their semantic roles. He argues that names occur in two basic circumstances: one involving vocatives and their use in naming predications, where they are not definite; the other their use as arguments of predicators, where they are definite. This division is discussed in relation to English, French, Greek, and Seri, and a range of other languages. Professor Anderson reveals that the semantic status of names, including prototypicality, is crucial to understanding their morphosyntax and role in derivational relationships. He shows that semantically coherent subsets of names, such as those referring to people and places, are characterized by morphosyntactic properties which may vary from language to language. His original and important investigation will appeal to scholars and advanced students of linguistics and philosophy.